Peeper frog egg mass, soon to be mini tadpoles. Every night out here has been a maddening chorus of peeper frogs a type of chorus frog. They have never been this loud or numerous. Then again we never had field puddle ponds like this either. This is one of the best parts of country living. Nature’s “zoo” we are a part of out here: Deer, geese, ducks, eagles, hawks, buzzards, owls, cranes, herons, foxes, coyotes, raccoons (trash pandas), opossum, squirrels, lizards galore in the summer, a ridiculous amount of bugs, and of course tons and tons of peeper frogs this year. Wouldn’t trade it for anything. Peeper frog egg mass, soon to be min tadpoles. There is a depression in the field next door and it has been full of water for a year. It is nearly three feet deep, and now has an established ecosystem. I need to come up with a name for this new body of water. 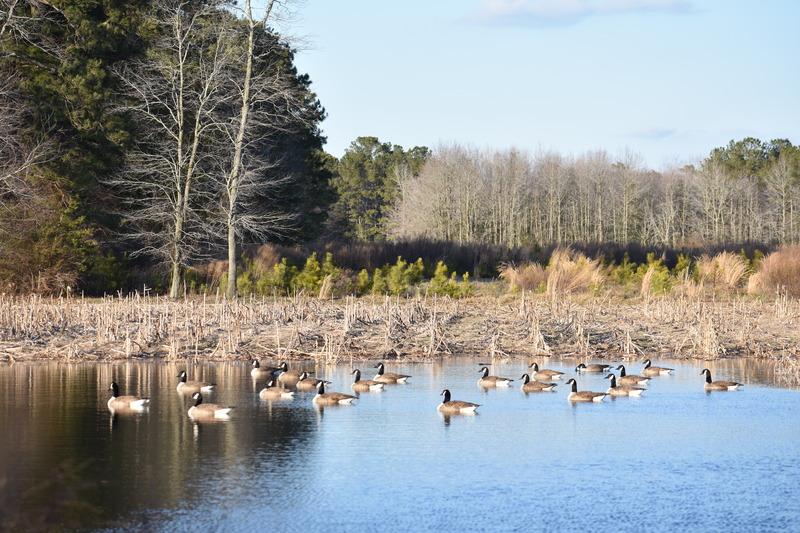 Last year a couple geese showed up, built a nest, and now it is home to a family of roosting resident Canadian geese. We also have a few ducks, and recently an occasional visiting great blue heron. The local eagles and red tail hawks use it to bathe their claws, after they eat one of the other birds. I need to add fish, the peepers are feeding the birds, as is the grasses growing in the field. The birds are feeding the eagles, hawks, and owls. The foxes feed on the geese at night, you can hear that too. The peepers meanwhile are just blaring away, loud as ever. Not much bothers them, they are out during the day. The peepers don’t care when the geese start fighting or whatever it is they do at night. Now the puddles are receding and there are peeper frog black egg masses all over the low spots. The tadpoles won’t hatch, much less make it for the months they need to develop into a spring peeper. Field puddle, in the background is the mini pond that has been there for a year. I’m sure the eggs will survive just fine in the main field pond. But the surrounding puddle ponds will dry up soon enough. Unless we get even more rain, we need it because my mud is getting dry. The mosquitoes this year are going to be ruthless. Might have to go rescue a bunch of these peeper frog eggs to grow more frogs, to eat all the mosquitoes. Peeper frog egg masses are everywhere in these shallow puddles. Peeper frog eggs in a mass, soon to be mini tadpoles.